Are you looking for a back toning exercise for an attractive back? A well-developed upper back gives you that appealing V-shape, which makes your waist and hips look slimmer. And a strong back makes good posture possible. Your mom was right: When you stand up straight, you look 10 pounds lighter. So pick out a Back Toning Exercise (or three or four), give it a try, and you’re well on your way to a strong, healthy and well toned back. Lay on your stomach with your arms long at your side and palms face up, or as shown clasp your hands if you are able. “Zip up” your abdominal muscles like you’ve just put on a tight pair of jeans and hollow out your pelvis. Lift your chest and head off the mat, keeping your nose pointed down and raising your arms up off the mat, reach your fingertips down to the end of the mat whether hands apart or together. Repeat for 4-6 repetitions working to hold up to 20 seconds. Keep looking down and reaching out through the crown of your head. 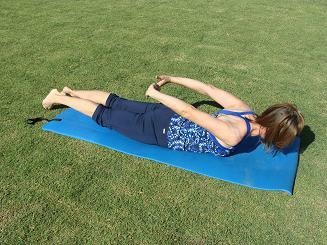 Abs stay zipped up as you feel your shoulders slide down your back. This is a great back strengthening exercise especially done with the hands clasped across your back for more stretch and then lift them up off your back as you lift your head and chest. Kneel on all fours with your hands directly under your shoulders and knees under your hips. Be sure your elbows are not locked. As you breathe out, engage your abdominals and extend your right arm and your left leg. Try to hold them level at shoulder and hip height without losing your balance or letting your back arch. Breathe in to return to start position. Alternate 4-6 repetitions on both sides. Keep the trunk as still and unmoving as you can. Lengthen out from yourtailbone to the crown of your head. Draw your belly button in, but do not round your spine. To keep tension out of your upper body, think of keeping your chest open and neck long. Check out these and more great back toning exercises in the new Pilates ebook, PLUS get the five greatest abdominal exercises! Standing tall or sitting tall on the mat with your legs extended long in front. Your heels and hips are glued together and your feet flexed. Arms extend out to the sides as you reach out through your fingertips. Inhale to lift up out of your hips. Exhale and rotate from the waist to turn your upper body, as if you’re trying to see your wrist, pulsing two times as if to wring the air out of your lungs. Inhale to return to the center and then exhale before repeating movement to twist the other way. Do three to five sets. If you have tight hamstrings or less-than-perfect posture, you can sit on a small cushion or rolled mat, which will enable you to sit up tall even with your legs straightened out in front of you. Another variation is to do the Spine Twist while sitting on an exercise ball with knees bent, feet parallel and just wider than hip distance apart. As you rotate the spine, focus on cementing the body from the hips down, to avoid shifting your hips. Stay anchored from the base of your spine to the very top of your head. Grow your fingertips long from your arms as you twist. Think heavy on the tush, as if you are anchored in cement from the hips on down. Head follows hand. Think tall, taller, tallest! 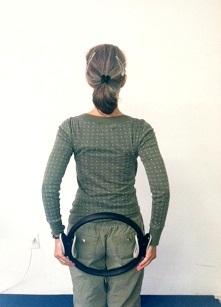 Standing with the magic circle behind you and holding the circle with your arms long and palms gently pressing. Inhale to get taller and then exhale as you press the ring lengthening your arms away from your body feeling the work in the upper back of the arms and shoulders. Repeat the presses quickly pulsing the magic circle for 8-10 repetitions. Relax your arms down and then repeat another set. Try not to squeeze the ring tightly, just use pulsing movements staying tall as you lift your arms and press. Leaving your hands in the same position, lower your bottom backward onto your heels. Lower your upper body until your forehead is resting on the floor and stretch your hands in front of you as far as you can. This should feel REALLY good. Try this exercise between the back toning exercise to stretch your back, and also at the end of the session. Find more free Pilates and back exercises and information here.